We provide comprehensive nutrition, fitness, and wellness services. I help you navigate through the world of nutritional choices and create a fitness plan that works for you! With so many contrasting and conflicting food, nutrition, and fitness messages out there, how could you not be confused? As a registered dietitian nutritionist (RDN) and personal trainer, I will help you learn what is real and what will work for you. I offer my clients sound, proven, and reasonable advice that is both science-based and applicable to your lifestyle. 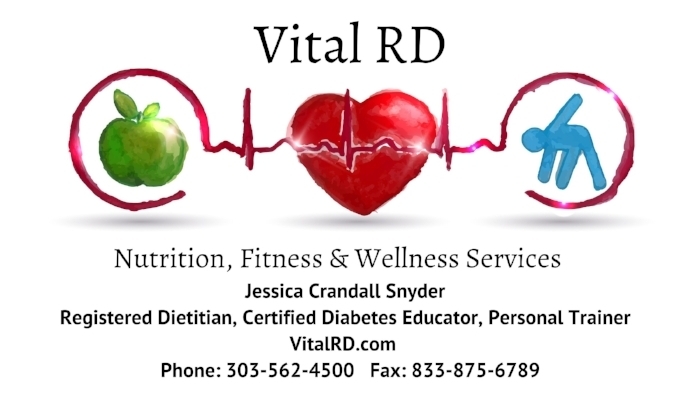 Jessica Crandall Snyder specializes in teaching you how to succeed in reaching your nutrition, health, and fitness goals. Ready to take the next step? Let's avoid what you hate and embrace what you love! We will make it work for you.